Image to pdf maker software supports almost all popular image formats including TIF, TIFF, JPG, JPEG, , WBMP, GIF, BMP, PNG, WMF, EMF, PSD,PCX, TGA, ICO, PCD etc. 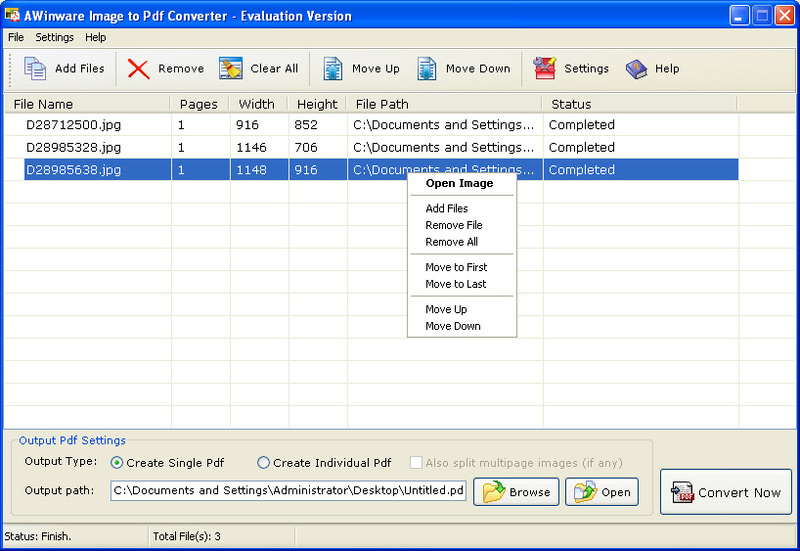 Photo to pdf creator is robust utility which can also convert TIFF bitmaps containing multiple frames. This awesome application provides various presets to adjust image & pdf size. Image size can also be adjusted; it can be original size, fit to page size and stretched to page size. Resurrect boring images to a stunning new look using Image Merger .EXE. Convert PostScript to bmp, tiff, jpeg, gif, png, pcx, emf, wmf, and so on. MSCABImage is the best cure from nasty posting bots (robots). Qweas is providing links to Image to Pdf Merger for Windows 1.0.1.3 as a courtesy, and makes no representations regarding Image to Pdf Merger for Windows or any other applications or any information related thereto. Any questions, complaints or claims regarding this application Image to Pdf Merger for Windows 1.0.1.3 must be directed to the appropriate software vendor. You may click the publisher link of Image to Pdf Merger for Windows on the top of this page to get more details about the vendor.